Script from Bazooka Joe Bubble Gum commercial, circa 1991: "(Gum bubble bursts in camera.) 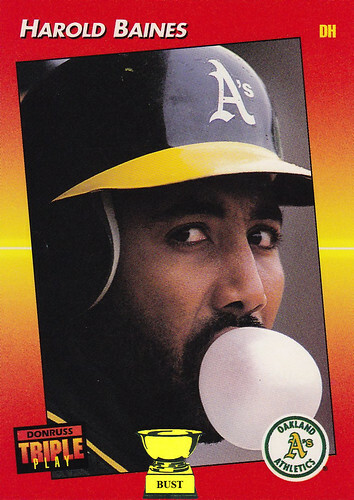 Hey, kids, Harold Baines here for Bazooka Joe Bubble Gum. I'm a designated hitter on the diamond, but I'm a designated blower everywhere else. (Baines blows a bubble that splatters all over his face. He uses his tongue to get it off.) I blow at home. I blow in the car. I blow in the store. I blow on the streets. I blow in alleys. I blow in bath houses. I blow whenever I see a teammate in the locker room. I blow whenever I get the chance. You see, kids, it's all about blowing. And if you want to blow the best, blow Bazooka Joe. You get a good pop in your mouth every time." Miami Dolphins scouting report on top draft choice O.J. McDuffie: "Earned a degree in labor relations, so he's probably a hard worker. Or maybe a Teamster. ... All the guys were jealous of his super slim waistline. ... Played for Joe Paterno, so he'll have no trouble with our crusty, old coach, Don Shula. ... Excellent knitter. ... Last name is a little girly. 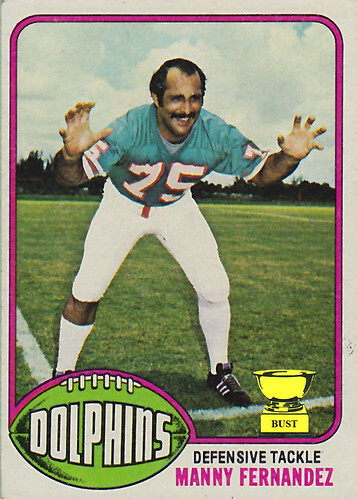 ... May be the key to getting Marino a Super Bowl ring — hopefully that way he'll actually stop whining about it for once. ... Says his life dream is to join Boyz II Men. ... Spends a little too much time around statues of lions. ... Has the same first name as O.J. Simpson, and he was real fast." 3) "Fat Man," "Little Boy" and "The One I Don't Use"
Train of thought by V. Wells, Upper Deck checklist artist, from 7:11 to 7:12 p.m., Jan. 4, 1993: "Let's see, Mets, Mets. ... Holy crap look at these sunglasses! So shiny. So manly. So futuristic. I must paint them. They're so graceful! Look at the sleek lines. They're the ultimate in reflection. I bet if I had a pair of these, I'd be more respected as a part-time baseball illustrator! ... Wait, what's this? There's a person in these photos? 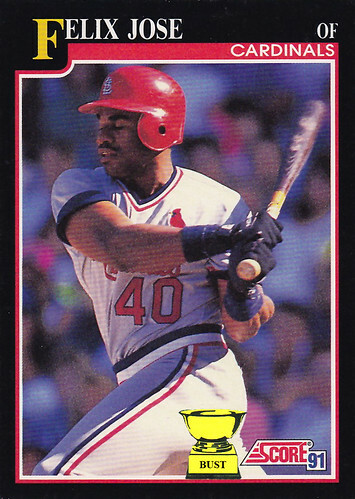 Damn you, Bobby Bonilla and your veiny arms! I swear by all that is holy on this Earth that I will make those sunglasses mine!" 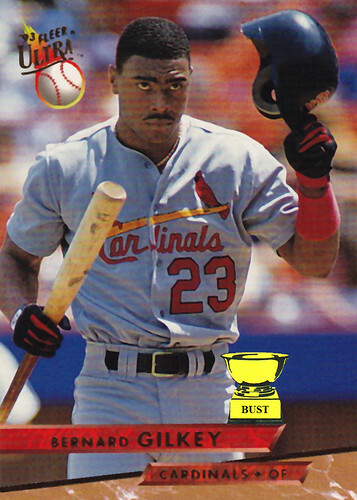 Update: According to that bastion of information, the Internet, V. Wells, who has done many Upper Deck illustrations, is actually Vernon Wells Sr., father to current Toronto Blue Jays "star" Vernon Wells. 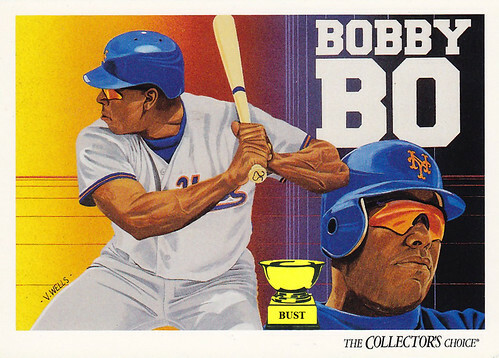 Also, he never stole Bobby Bonilla's sunglasses. 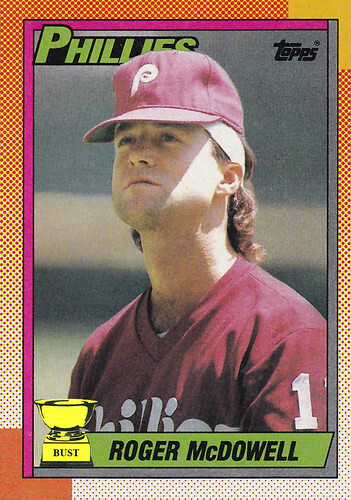 Script from Roger McDowell's 1989 TV commercial: "You may know me for being the go-to guy when the Phillies need a save. But until recently, I've been wondering who would save me from neck pain. (Cut to shot of a grimacing McDowell rubbing his neck during a game.) My mullet is my baby, but its volume and heft were killing me! That's why I invented this: Roger McDowell's Hair Bra. (Cut to shot of McDowell holding product like a newborn.) The Hair Bra works like this: Slip it over your head and tuck it under your mane. Adjust to fit, and that's it! Your neck gets the support it needs without covering up that beautiful Tennessee waterfall. Sure, you won't be able to fit a ballcap over it, but that just means the party in the back will be that much more visible. Thanks, Hair Bra!" 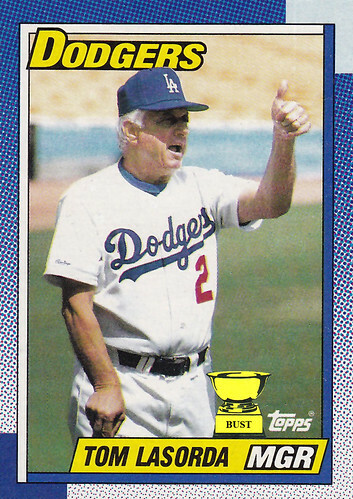 What's getting the old thumbs-up from Tommy Lasorda? (A) News that the team's training table now involves only barbecued beans and Stouffer's frozen macaroni and beef. (B) Dress rehearsal for Kirk Gibson's all-male burlesque revue, "I Can't Believe What I Just Saw." (C) The five Dodger fans who stayed past the seventh inning. (D) An invitation to an Asia concert from Eddie Murray. Script from Acme Towels television commercial, circa 1993: "What's up, guys. 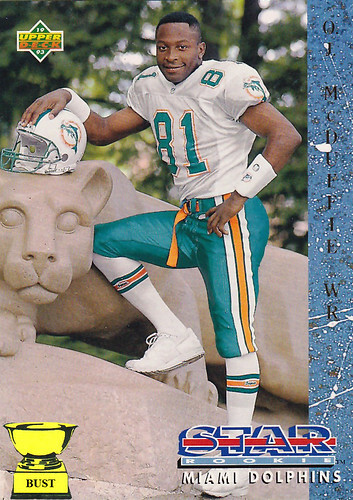 Greg Vaughn here for Acme Towels. You ever go outside and start sweating? Don't even think about taking off that heavy jacket. Grab an Acme Towel and wipe away the heat. Acme Towels are cool and soothing, kind of like me. (Tips back head in pleasure.) They feel good on your head, whether you have an afro, jheri curl, mullet or flat top with lines shaved into the sides. Acme Towels come in three colors: white, white and white. They're soft to the touch and hard to forget. Acme Towels, grab one the next time you need relief from the heat but you're too cool to take off that jacket." 6) Shoulder pads for his "buddies"
What does this particular M.V.P. award stand for? 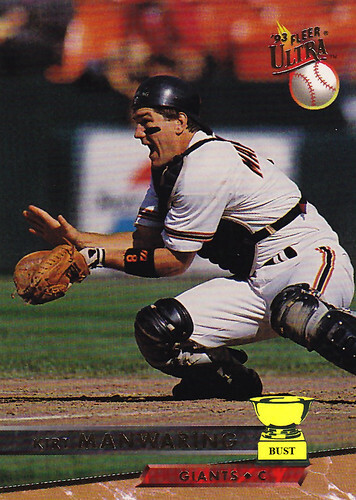 Key 1993 stat: 12,042 times recounted the story of "The Slide"
The man, the legend: There's much more to Sid Bream than a neatly trimmed mustache and 1,000 crows' feet, despite what you see on this card. 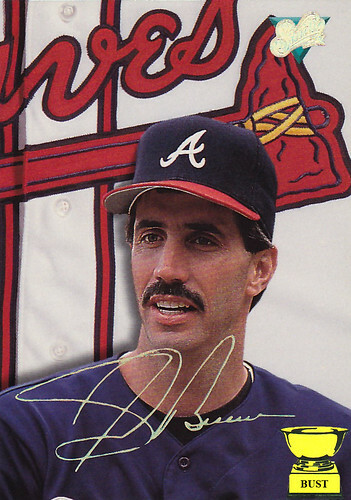 This is "El Sid," the man who launched a million mulleted Braves fans into ecstasy after sliding under the tag of "Spanky" LaValliere in Game 7 to send Atlanta to the World Series. 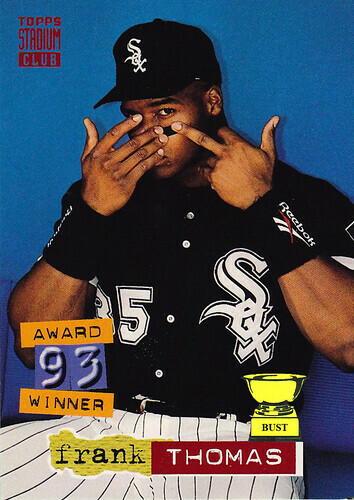 He was the first man to keep a ring off Barry Bonds' finger (though he wouldn't be the last). Sure, by 1993 he was mostly washed up, regaling his young teammates with the story of a play that had happened only one year earlier, but "El Sid" is legend. Speaking of legend: The 1993 Studio set, however, is definitely not legend. 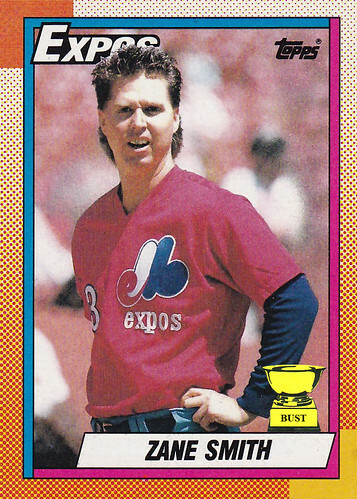 It's hard to believe that the makers of one of the most mockable sets in baseball history just two years prior decided it would be a good idea to throw a section of jersey or hat behind every player for each card. Even Chris Sabo's face-windshield couldn't save it from its own lameness. One fast B.J. : I remember watching B.J. Surhoff play. I remember laughing a little every time his name was uttered over the airwaves. 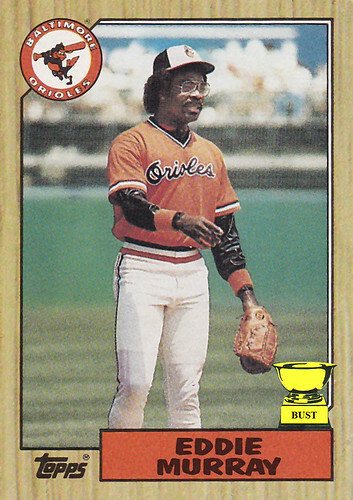 I even heckled him one time in person when he was with the Orioles. But I don't remember him being faster than light. Look at that motion blur! He must have gotten out of his crouch before the batter was done swinging. 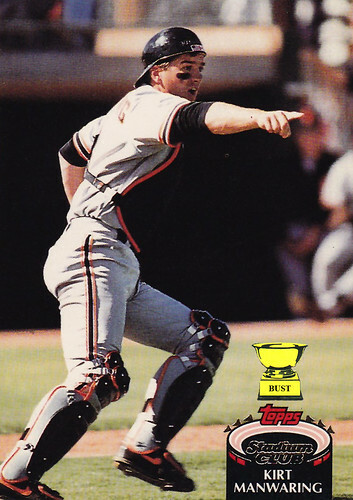 Of course, we all know how hard it is to capture B.J.s on film, so it's possible Topps set up a motion-sensing camera outside Surhoff's home, hoping to catch an unsuspecting B.J. before he shot out of the frame. Why is the fat white guy running at Bryant Young? (A) He's an Upper Deck employee, and he's trying to save the company's reputation by stopping this card from making it into production. (B) He's blinded by lust, and is trying to grab a couple of pineapples. (C) He's an actor, inserted into the shot by the photographer to provide scale to just how buff Young is compared with an average middle-aged white guy. (D) He's the photo shoot's oil boy, and beachgoers are about to be disgusted. 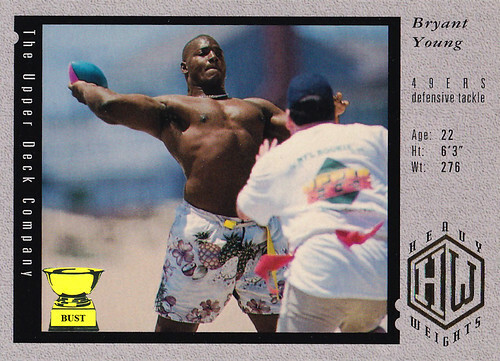 (E) He's a Fruit of the Loom lawyer, and he's serving Young with a cease-and-desist order for copyright infringement. Sojo's mojo: Most players make it to the big leagues because of their on-the-field skills. A few make it because of their swagger. One man made it because of his looks. 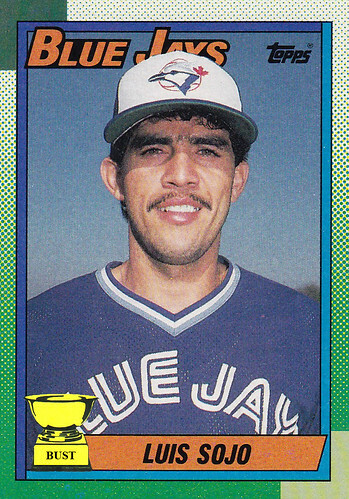 That man: Luis Sojo, utility infielder and casanova. Sojo left his family and 67 wives in Venezuela to come north to Toronto, Canada's City of Romance. The Blue Jays needed power, speed and defensive sure-handedness. Sojo had none of those things, but he did have a monobrow, manicured mustache and greasy hair peeking out from beneath his ill-fitting hat. Within days in Toronto, his massive head adorned billboards. Women immigrated to Canada just to catch a glimpse of the man they called "El Guapo." He couldn't hit worth a lick, but a wiggle of his ears caused capacity crowds to faint. The Blue Jays' attendance went up, bedroom trysts went down, and Sojo stayed even, hitting .225 on the field and .775 with the ladies. 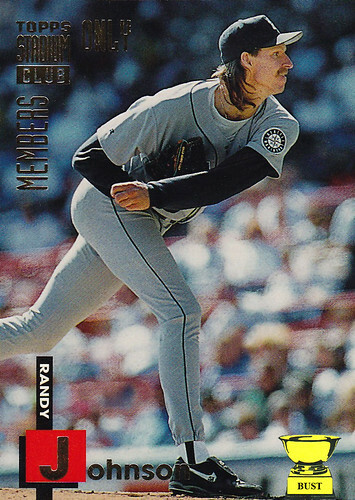 What name did Randy Johnson's teammates give his mullet? Script from "Hendu's Romper Room" children's TV show commercial, circa 1992: "Hey, kids, gather 'round. It's your big buddy Hendu, host of 'Hendu's Romper Room' on public-access Channel 74 in Oakland. You want to get in the game at 4:30 in the morning? Stop by and have some big-league fun with your pal Hendu, a guy who likes to clown around. What kind of fun do we have? Well, check out my buddies in the dugout: We talk on the phone, we drink beer, we catch some zzzz's, we catch some more zzzz's, we grab our gloves and get ready for the game, we cross our legs and chew tobacco, and we cheer on our fans - you little guys. So, tell your parents to get you up before the sun comes up and turn your TV to Channel 74. 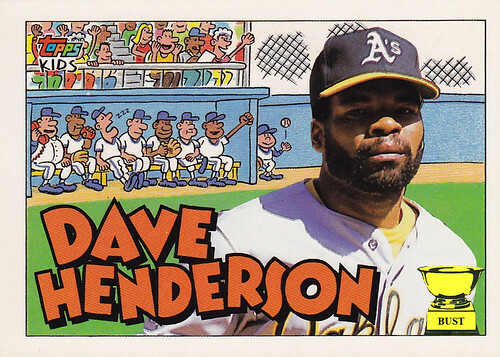 'Hendu's Romper Room' is on, and we're playing with balls - baseballs, that is." 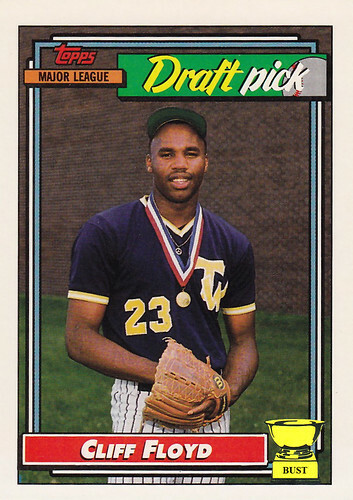 Expos' scouting report on top draft pick Cliff Floyd: "Big-league swing, bush-league hat. ... Wears Little League uniform with pizazz. 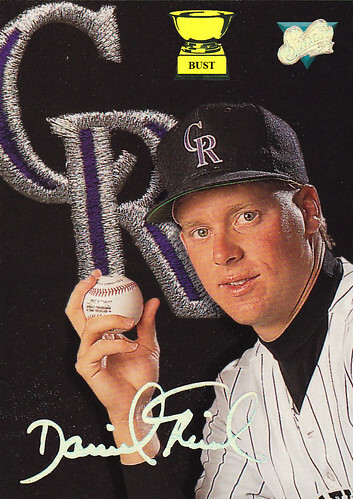 ... Creepy stare may intimidate pitchers; will intimidate children. ... Impressive credentials: second-place medal, pig raising, Tuscaloosa County Fair 4-H competition. ... Spent time in prison yard, as photo shows. ... 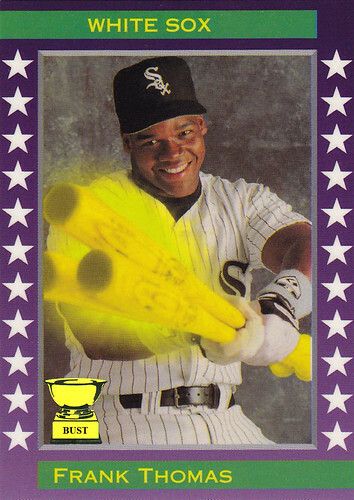 Hits doubles, hits on singles. ... Looks like an athlete, has name of a nerd. ... Fashion sense points to guaranteed future in beer league softball. ... Likes Molson, hockey and wrestling bears - should fit in well in Canada. " 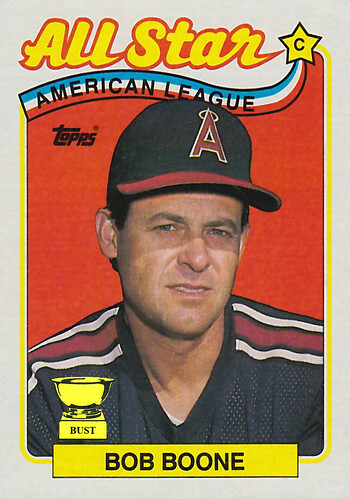 Bob Boone once caught both ends of a doubleheader. For both teams. 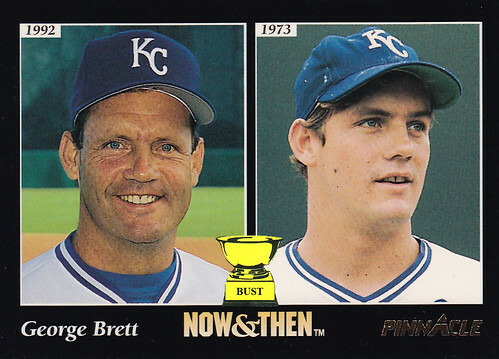 Bob Boone did not take batting practice. He just took batting. Practice is for wusses. 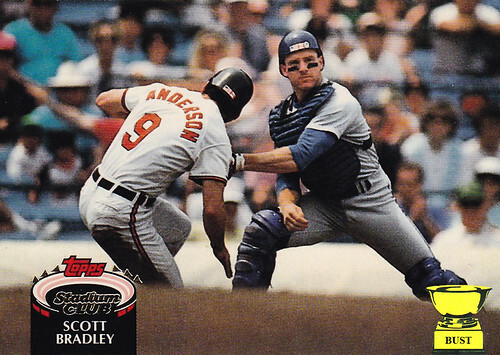 During spring training in 1988, Jim Abbott once did in fact shake off a pitch Boone had called. That is how Abbott lost his hand. It's true. Boone did not wear a cup. His bulge was tougher than any baseball. The brim of Boone's hat in the above photo is not 5 feet wide. It's just that anything Boone touches becomes larger than life. Bad, bad decisions: Fed up after star quarterback Joe Montana threw his eighth interception of the 1989 season, head coach George Seifert knew he could turn to only one man. No, not future hall-of-famer Steve Young. 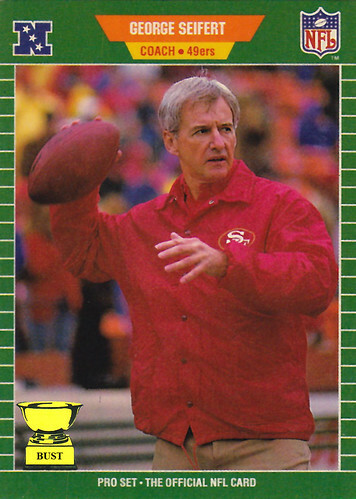 The only man George Seifert could trust was George Seifert. 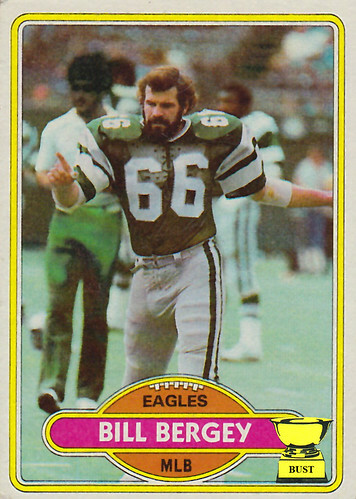 On the team's next possession, the coach told both of his QBs to ride the pine and strutted out onto the field in his windbreaker to lead the offense. A calm, confident Seifert called a play for his bewildered offense, took the snap from center, dropped back, and was promptly crushed by three Atlanta defenders. Seifert watched the rest of the season from the sideline, where he made Young use a wire to scratch under his full-body cast. 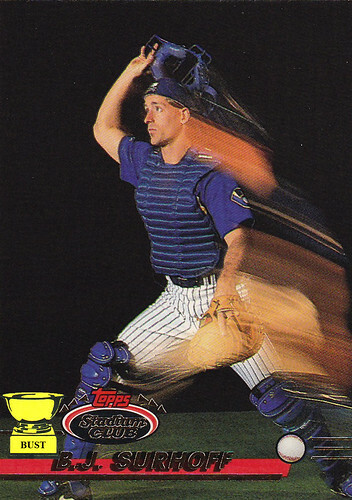 Catching heat: Roger McDowell must have majored in being a jerk at Lasorda University. 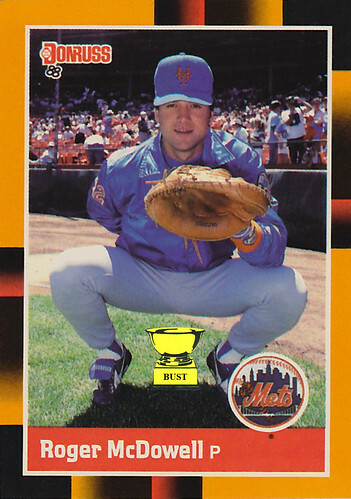 When Donruss came around to take its photos for its 1988 set, McDowell stole one of catcher Gary Carter's mitts and promptly took a squat. "Hey guys, look at me! I'm Gary Carter. Did you guys know I only batted .235 last year? And that I'm fat and slow and stupid?" McDowell went on, saying unfortunate things about Carter's wife and questioning his masculinity in about 20 different ways. The cameramen were uncomfortable, but not as uncomfortable as McDowell after an irate Carter ran over and stretched the mitt over the closer's face. 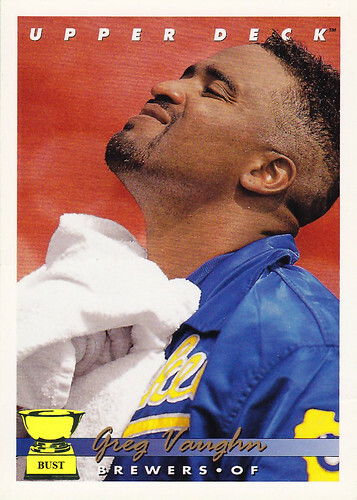 Key 1992 stat: 10, 839 "curtain calls"
Thank you, thank you very much: Bernard Gilkey always had a flair for the dramatic — just not with the bat or glove. Gilkey loved praise, and would respond to any positive remark with a tip of the cap. If he heard a fan say "Good eye!" after he took a pitch for a ball, Gilkey would step out of the box, turn in the fan's general direction, and doff his cap. Every time he'd catch a fly ball at home, he respond to the scattered applause with a bow and a wave. 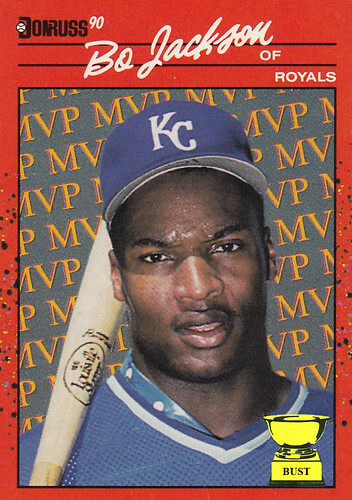 And the seven home runs he hit in 1992? Remember the lap Cal Ripken Jr. took around the stadium when he became the Iron Man? Like that for each dinger, only more grandiose.